"Southern Border" redirects here. For the international border between Mexico and the United States, see Mexico–United States border. 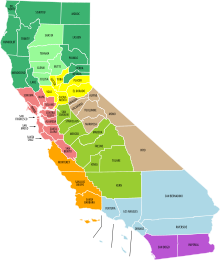 The Southern Border Region is one of nine such geopolitical designations in the State of California, United States, used for economic analysis. The region is defined to include San Diego County and Imperial County, each of which borders Mexico. Its largest city is San Diego. ^ a b "2009 Southern Border region economic profile.pdf" (PDF). Labor Department of the State of California. Retrieved 2011-06-09. ^ David Carroll; Jean Ross (2003). Boom, bust, and beyond: the state of working California. California Budget Project. Retrieved 2011-06-10. ^ "AB32 Policy Brief v.2" (PDF). UC Berkeley center for labor research and education. Policy Brief. February 2009. Retrieved 2011-06-09. ^ "California economic base report: Southern California region" (PDF). Labor Department of the State of California. December 2006. Retrieved 2011-06-09. ^ California Economic Strategy Panel (December 2006). "California economic base report: Southern Border region" (PDF). California Labor and Workforce Development Agency. Archived from the original (PDF) on 2011-10-01. Retrieved 2011-06-09. ^ "California: Southern Border region. Wireline and Fixed Wireless Broadband Availability" (PDF). California Public Utilities Commission. Retrieved 2011-06-09. "Economic Strategy Panel - The Southern Border Region". California Economic Strategy Panel. Retrieved 2011-06-09. "Economic Strategy Panel". California Labor and Workforce Development Agency. Archived from the original on 2011-07-11. Retrieved 2011-06-11.